Everyone’s favourite toy turns 60 this year! 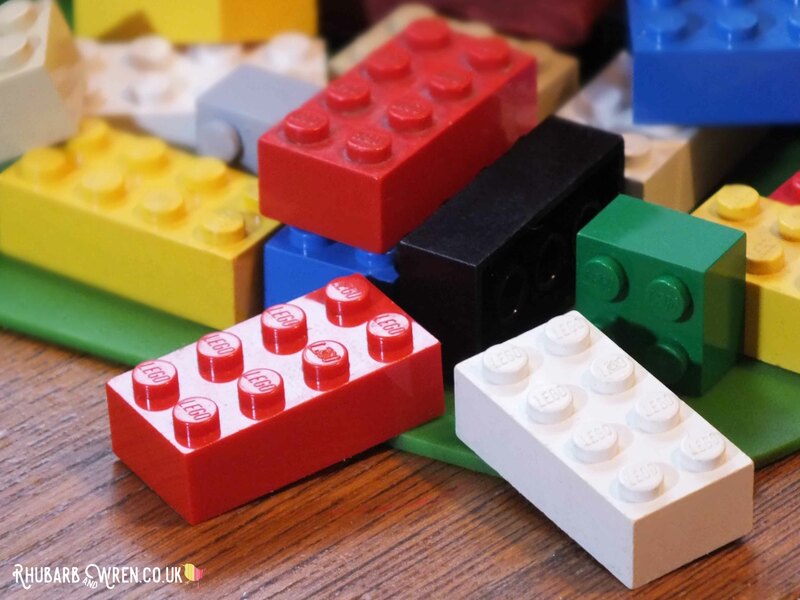 Sunday, 28th January 2018, marks the 60th anniversary of the patent approval for the form of the Lego brick that we know and love playing with today. To celebrate this great achievement (and because we need little excuse to party) we’ve made our own Lego brick – fixing the only downside to Lego (it’s made of plastic – boo!) by making ours out of a far more environmentally-friendly material… Cake. Yes, it’s a giant Lego brick cake – Yum! Read on to find out how to whip up a Lego brick cake yourself – it’s so easy, you can do this even if you’re an absolute baking beginner. I freely admit that I’m not a frequent maker of novelty cakes – mostly because my home baking tends to taste better than it looks and most of those fancy-pants, Pinterest-worthy cakes are way out of my ability league. But a Lego brick is just a rectangular cube with a few studs on top. How hard could that be? No seriously, not that hard, right? Right! In fact, it’s easy peasy – and you can make one too. Before we begin, a quick word on the cake itself. You could use any recipe to make a LEGO Brick cake as long as you bake it in a rectangular tin – it’s going to be completely covered in icing so if you want chocolate cake or lemon, it doesn’t make any difference. We went with a classic Victoria sponge cake recipe – it’s a family favourite and firm enough to hold the shape well (at least when I make it!). The other benefit of this recipe is that it uses only four readily available ingredients (not counting filling and/or icing) and it’s so quick and simple that my children can and do make this all by themselves. For this cake, I used my (affiliate link alert!) mega-huge square cake tin that has dividers to create all sorts of square and rectangles in all sorts of sizes. As I’m rubbish at judging sizes (ahem) I may have ‘accidentally’ made a rather humongous cake that swallowed up all my cake mix so easily that I had to go back and make another batch to top it up. I used eight eggs in the end! Like I said, HUGE cake. The recipe quantities here are based on the assumption that you are being more modest/sensible, and using a rectangular tin of around 9” capacity. It’s a very easy recipe to alter as quantities are based on the weight of the eggs, so if you need it a bit bigger then just add another egg or two (before you start mixing!) and increase all other ingredients to the new weight as well. 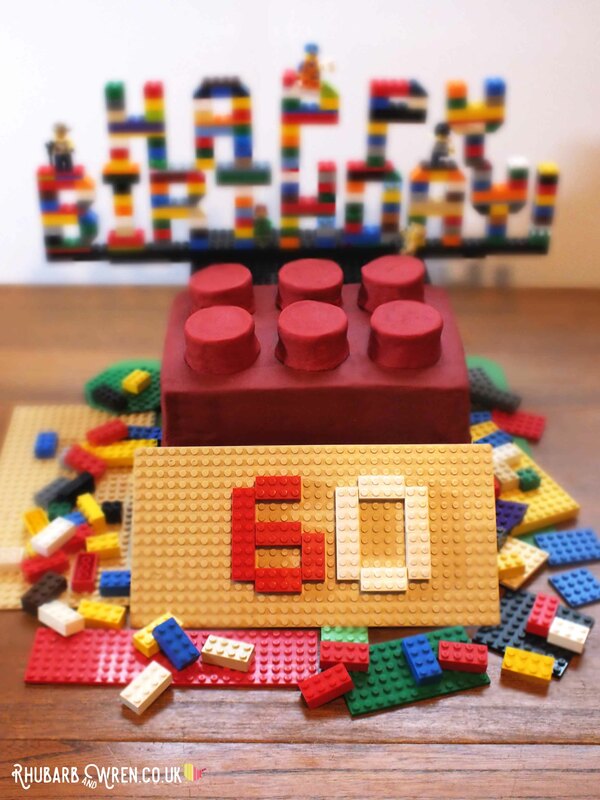 Celebrating 60 years of Lego with the mighty Lego Brick cake. 4 large free-range eggs. Weigh these (in their shells) to determine how much flour, sugar and butter to use – you need to use equal weights of each of these key ingredients, so always start with weighing the eggs. Margarine (e.g. Stork) – you’ll get a lighter cake than using butter, and it contains much less fat. I made my cake extra long, so I could trim some thick slices off the end to use for the little studs on top of the LEGO brick. Alternatively you could bake a separate small cake for this purpose (or cheat and buy a nice firm Madeira cake). Basically, you just need something edible and the right shape that you can cover in fondant icing and stick on top… other suggestions are a sliced-up Swiss roll, Oreo biscuits or those giant Reece’s Peanut Butter cups… Then again (and I only thought of this after making the cake – doh!) you could just shape a big lump of fondant for the studs and not bother wrapping anything at all. Your choice! 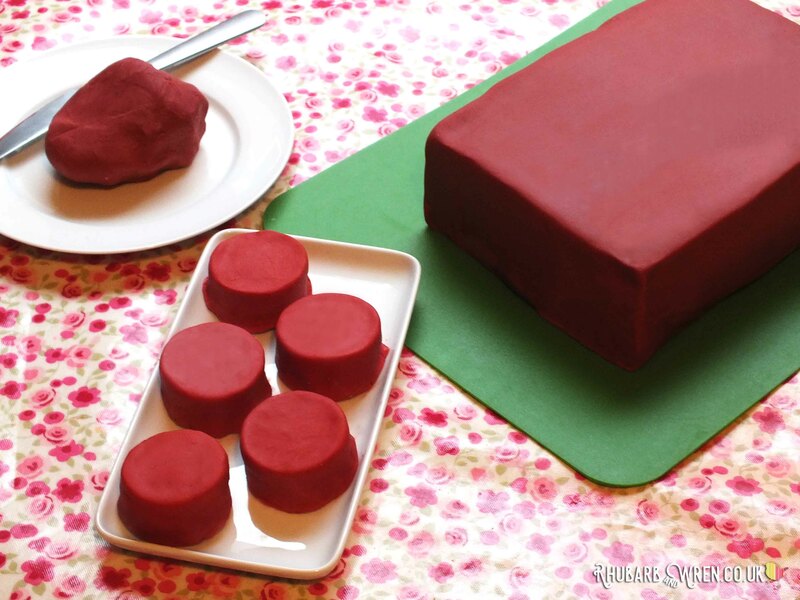 Fondant icing in your choice of colour. I started out with red and ready to roll but you can also buy white and colour it yourself with food dye gel (not liquid). Top tip – check how much you need before you begin! I used a whole 250g packet to cover just the studs for the top. but I needed another 500g for the cake itself… and since the pre-dyed red icing was all sold out when I went back to buy more, I had to buy white and dye it to match – my least favourite part of the process since it took three tubes of red, a dash of maroon, and a little of both rhodamine and brown dye to get it right! But I am pretty proud of the final colour match. My hands match the cake now also. Bonus. 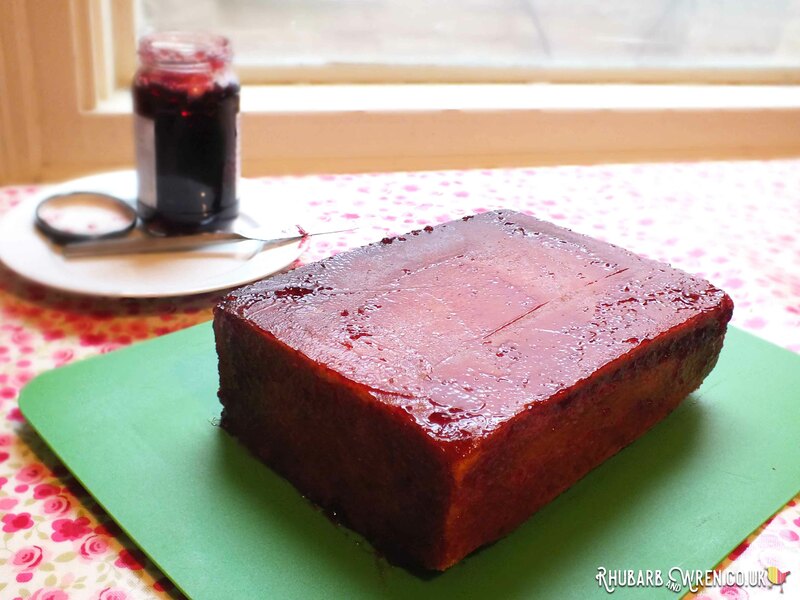 Jam or buttercream – e.g. sticky stuff to cover your cake with, so that fondant icing sticks on. Pre-heat the oven to 180° C / 350° F / gas mark 4. Grease and line your cake tin (or tins if you’re making a layer cake). Cream together the margarine and sugar until light and fluffy. Once you think you’ve done enough, stop and scrape down the sides. And then do some more. One at a time, beat the eggs into the mix along with a spoonful of the flour. Once all the eggs are mixed in, sift in the rest of the flour (and baking powder, if you’re using it) and fold that in too – if you must use the mixer here, try not to over-beat the batter at this stage as you need the air you’ve sifted in with the flour to get a good rise. Put the mixture in your prepared cake tin(s), and pop in the oven. Leave in the tins for 5 – 10 minutes, then turn out to cool completely. It must be absolutely cold for the decoration stage. And no, don’t put it in the fridge! That’ll just dry out the cake and make it all stale and yucky. 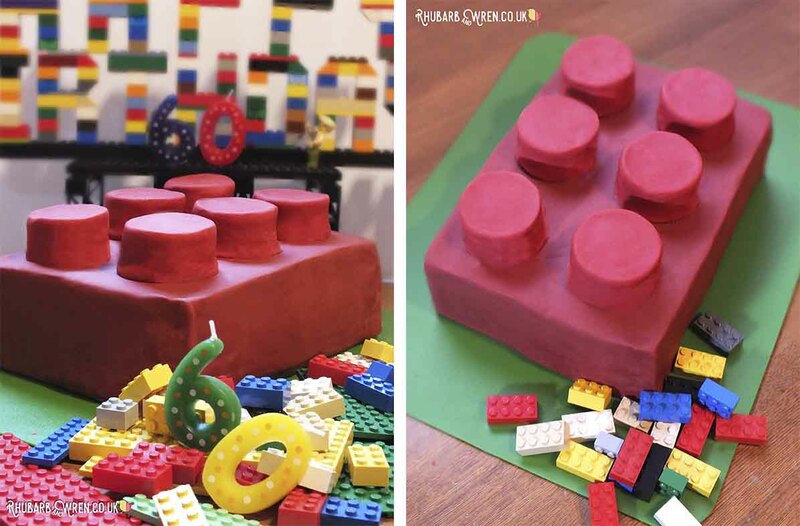 If using some of your cake to create those classic Lego brick studs, slice off enough from one end for the amount of studs you need. I made six for mine (because, 60th, but yes, I now realise it should have been eight for the classic brick) and was able to cut three studs each from two slices of cake I took off the end, using – affiliate link alert #2 – these circle cutters. Cut out mini sponge circles for the studs on top of your cake-brick. Use a piece of string to measure diagonally across your cake (including sides and a little extra for safety). You will use this as a size guide when rolling out your icing. Prepare your cake by coating it in either jam or buttercream. Buttercream will fill in any holes and create a much more even surface, but it is more work, and as my youngest is currently very against anything butter or cream related, we stuck with jam. You’ll need to pop the cake in the fridge for half an hour or so after coating if using buttercream (no need to do this if using jam), to harden up that coating a little before you put on the fondant icing, otherwise it’ll just fall straight off. Also, with buttercream you might want to add a second layer of buttercream on the ‘raw’ end (where you cut off slices), after the first layer has set. This ensures that any crumbs are caught by the first layer and smoothed out by the second. This is going to be a Lego brick cake, honest. Sprinkle a little icing sugar onto a clean, smooth surface and knead your fondant until it is easy to mould. 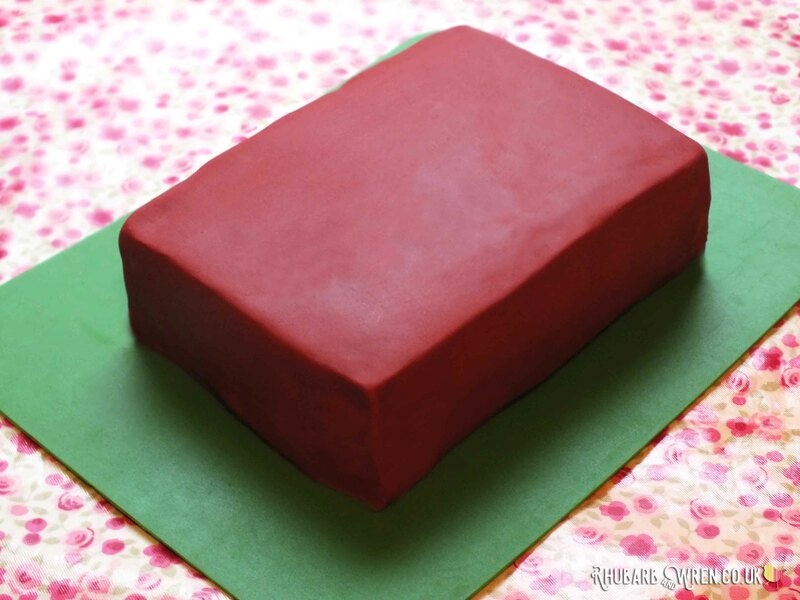 Form a rectangular cube and roll it out until it’s big enough to cover your cake (use your string to check). You don’t want this puppy too thin, or it will just stretch and tear when you lift it onto the cake. Between half to one centimetre thick is about right – but this is the most fiddly part of the whole cake, so be warned! Carefully lift and drape over your cake. Once in place, gently pull down any edges where it’s not quite long enough (be careful not to tear it though). Use your hands or something smooth like a glass with straight edges or this (affiliate link!) smoothing tool to flatten and smooth the fondant into place. You’ll find that the sides mould neatly as you smooth them down, but you’ll need to trim off the excess as you go. Starting to look brick-like, if not quite a Lego brick cake yet! Cover your cake studs the same way as the main cake – I used a larger circle cutter to cut out fondant icing circles for these. They were actually much easier to do than the main cake because of their smaller size. If you have any (unused!) letter stamps, you may want to imprint the words ‘LEGO’ into the stud fondant icing circles BEFORE you put them on the cake studs (you can make a better imprint that way) – but do make sure the stamps are clean and not contaminated by non-food safe ink. Alternatively you can pipe the lettering using some royal icing or a tube of ready mixed writing icing. Block, meet studs… I think you’re going to make beautiful Lego. Oh my, that’s a big Lego brick cake! The kids and I had great fun making this Lego brick cake – there’s no doubt that fondant icing can be a little fiddly to apply (especially on a big cake), but actually it wasn’t as hard as I thought it would be to get a decent-enough-for-the-kids finish. So if you can roll out play dough, you can certainly tackle this too. And while mine won’t win any cake decorating awards (and would most likely be rejected by Lego’s quality control for its wildly inaccurate measurements), this Lego brick cake looks effective enough to please my kids and make them smile. It is also rather tasty. 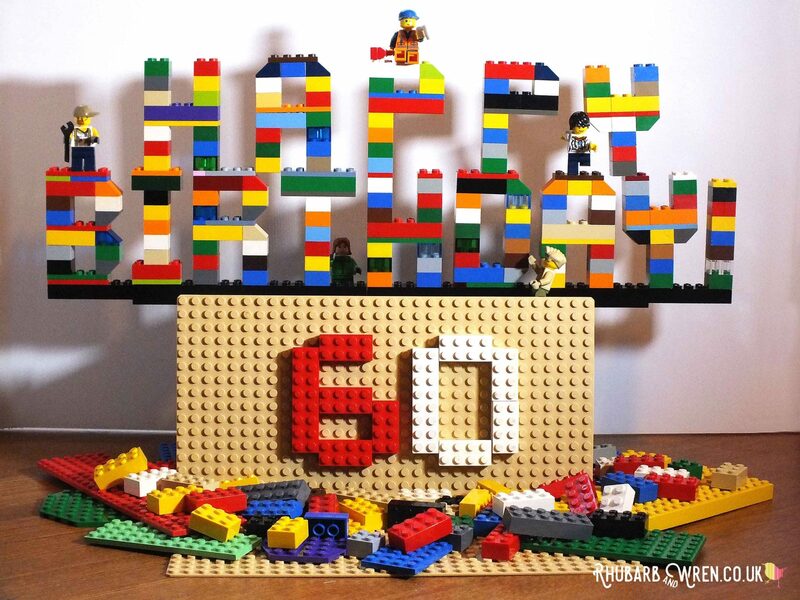 So happy birthday, Lego brick – here’s to 60 more years! As part of their 60th Anniversary celebrations, Lego have released these special limited edition sets, with the theme ‘Building Bigger Thinking’. Rather than having a specific design to build, these sets encourage more imaginative and open-ended play by providing a range of blocks and some starting idea instructions. I love the look of these and it’s great to see that they cover a range of budgets, from the pocket-money friendly £4.99 to the birthday busting £44.99 (still far from the most expensive Lego set around though). I’m pretty sure that one or two of these will end up in the Rhubarb and Wren nest before too long! Looking for more cakey goodness? Check out my other easy-peasy cake recipes here! 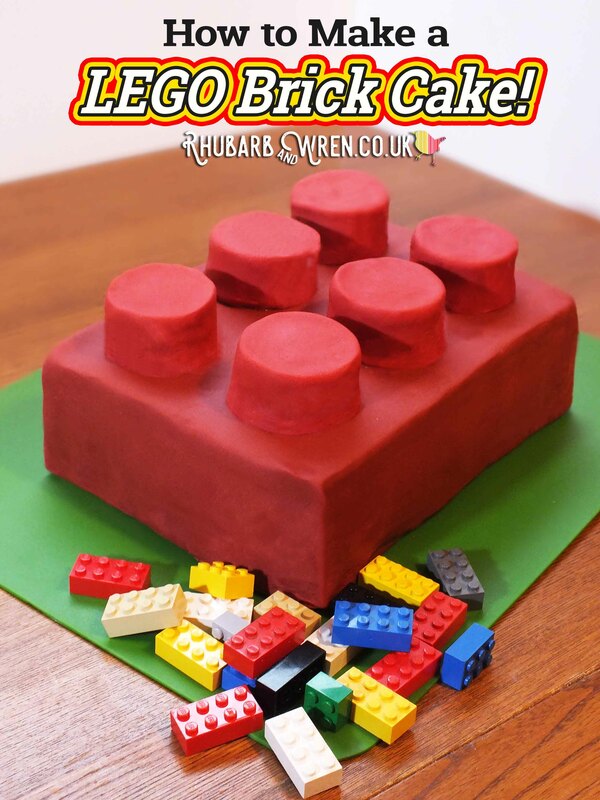 This giant Lego Brick Cake was so easy to make, even absolute beginners cake do it! 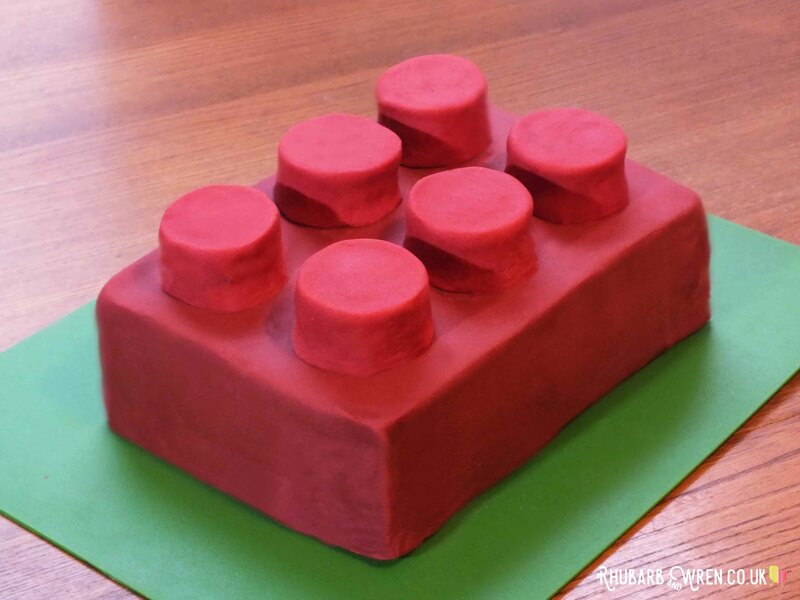 Say it with cake… and Lego… Happy Birthday! 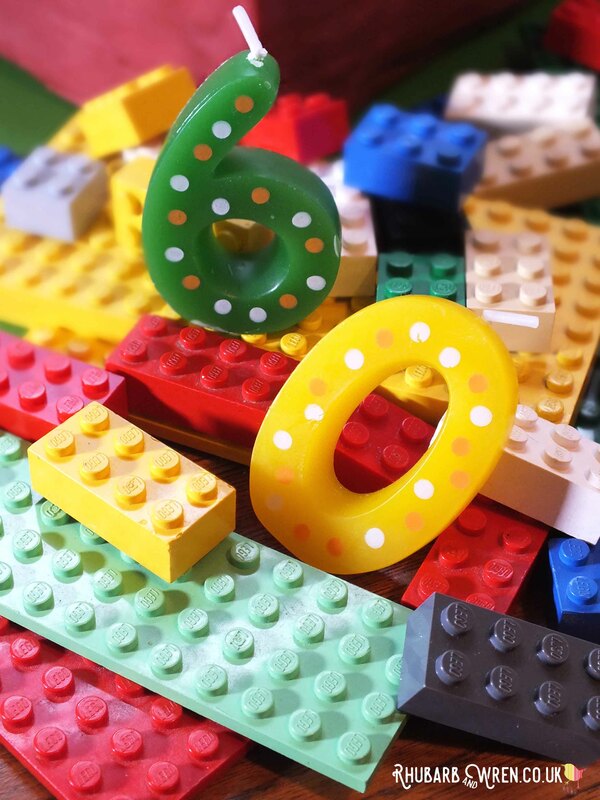 60 years of the Lego Brick! Birthday, Cake, LEGO, Party. Bookmark. My son is determined to have a Lego birthday party now so we can make another one! This looks FAB, and can’t believe it’s that easy! My lego-crazy son would absolutely love it. Sharing and putting on my to-do list this half-term! Thanks Nicole – I’m sure your son will love it!